The Invasion Has Already Begun!!! This Sh*t Is Gonna Be Off The Hook!!! 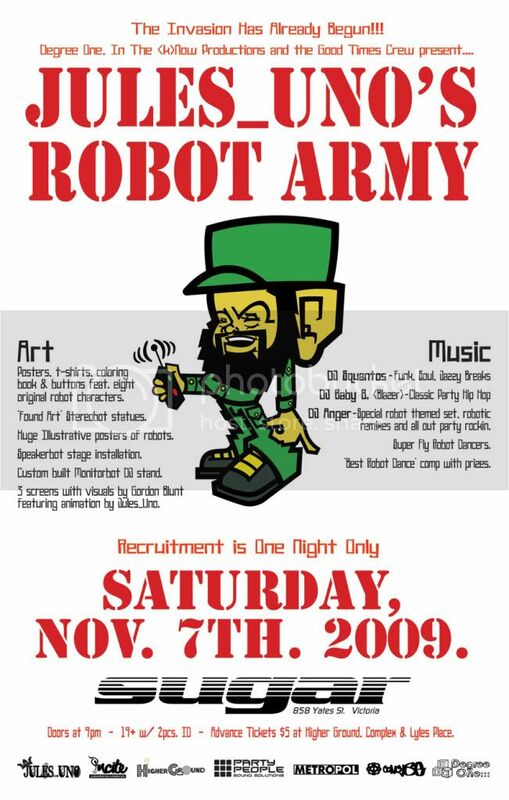 - Posters, t-shirts, coloring book & buttons featuring eight original robot characters. - "Found Art" stereobot statues. - Huge Illustrative posters of robots. - Custom built monitorbot DJ stand. - 3 screens with visuals by Gordon Blunt feat. animation by Jules_Uno. - "Best Robot Dance" competition with prizes. Advance tickets $5 at Higher Ground, Complex & Lyle's Place. Click HERE To See The Facebook Event Page, RSVP and Invite Your Friends.